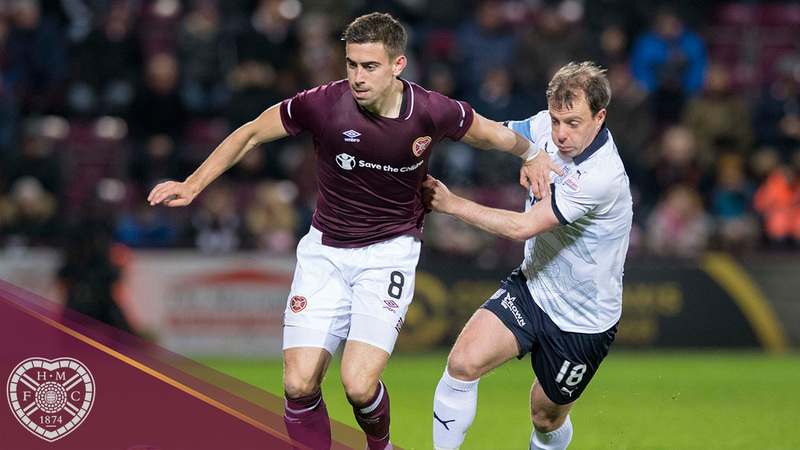 Hearts fell to a disappointing 2-1 defeat at home to Dundee this evening. 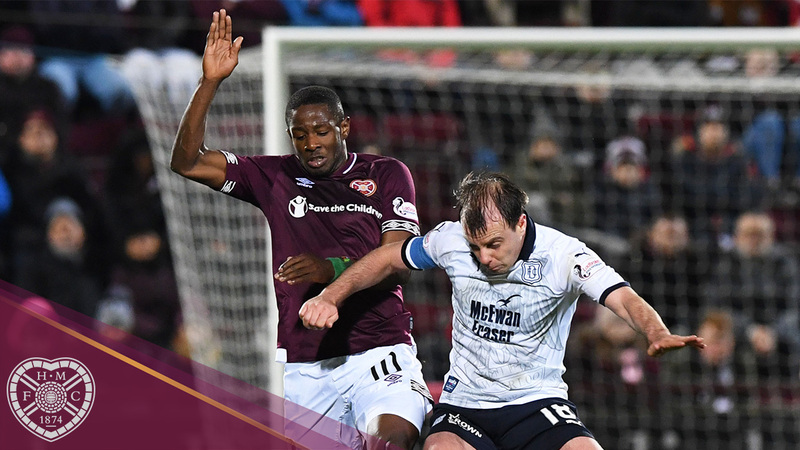 Genseric Kusunga gave the visitors the lead before Olly Lee’s free-kick deflected in off Jesse Curran to restore parity, but Andrew Nelson secured all three points for Dundee in the second-half at a bitterly cold Tynecastle Park. Craig Levein made two changes from the side that knocked Livingston out of the Scottish Cup on Sunday. Aidan Keena was handed his first start in the place of the suspended Steven Naismith, while Demi Mitchell came in for Ben Garuccio. Hearts had a lot of the ball in the opening stages but it was Dundee who took advantage of a slack pass five minute sin, with Andrew Nelson running towards the edge of the box and hitting sweet left-foot shot on target that Colin Doyle did brilliantly tip around the post, but much to Dundee’s chagrin a goal kick was given. Doyle had to be brave moments later as again Dundee capatlised on slack play to quickly break down the left through Nelson, and he played through-ball looking for the run of Jesse Curran, but the big Irish keeper was quick off his line to get their first and block the ball away. Debutant Keena was the first in a maroon shirt to try his luck on goal, drilling a low effort 25-yards but it was straight at Seny Deing and easily collected. Dieng was at his best to deny Hearts the opener on 19 minutes. The Jambos magnificently passed their way up the park before the ball was teed up for Arnaud Djoum outside the box, but his powerful strike was acrobatically pushed away by the Dundee ‘keeper. Mitchell was next to try his luck moments later, shimmying down the left before blasting a left-foot shot on target but Dieng got down well to smother the ball. 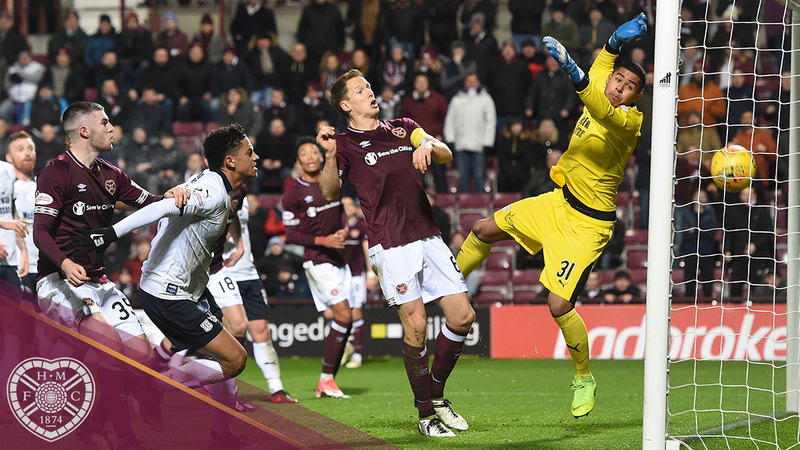 Despite Hearts coming more into it, it was the visitors who broke the deadlock after 24 minutes. Kusunga showed great strength to win the ball and hold off his man before playing a one-two with Nelson inside the box, and then slamming a close-range effort under Doyle. The manager shook things up early doors, replacing David Vanecek – who was on a booking – with Steven MacLean on 33 minutes. Doyle had to be alert minutes later when Jesse Curran swung a great ball into the box for his namesake Craig to head towards goal, but the Irishman leapt to pluck the ball from the air as it looked to loop over him. With five minutes of the half remaining Hearts were back on level terms. Mitchell was crudely hacked down out on the left and Lee stepped up to fire in a free-kick which took a big deflection off Jesse Curran and span into Dieng’s bottom left corner. Neither side made a change at the break and it was Hearts who threatened first. Callumn Morrison tore down the right and rocketed a shot on target, which Diem turned around the post. From the resulting corner, Christophe Berra rose to meet Lee’s ball in but his header was pushed away by Dieng. A lovely passing move up the pitch saw Hearts create a great chance to get in front, with MacLean’s touch back to Lee moved forward to Keena at the edge of the box, but he could only blast over. Moments later Hearts went close again when Clare burst down the right and sent an inviting ball across the face of goal, but neither MacLean nor Mitchell could get that crucial touch. Disaster struck in the 62nd minute when Dundee regained the lead. Conor Shaughnessy failed to control a through ball, allowing Craig Curran to dash into the Hearts box before squaring to Nelson, who made no mistake from eight-yards. The maroons went straight up the park and nearly equalised. Lee’s clever free kick down the line found Mitchell, who played a ball across the face of goal looking for MacLean, but Dieng got there first to smother the danger. Time was running out for the Jambos to get back on level terms and they passed up a great chance in the 81st minute when MacLean was brave to head the ball on to Jake Mulraney, who pressed into the box and cut inside but his effort was tame and didn’t trouble Dieng. Hearts went agonisingly close to getting that elusive second goal with two minutes remaining. MacLean sent Mulraney clear on the left and his ball in eventually fell to Keena, but his lashed effort flew inches wide of Dieng’s right-hand post. 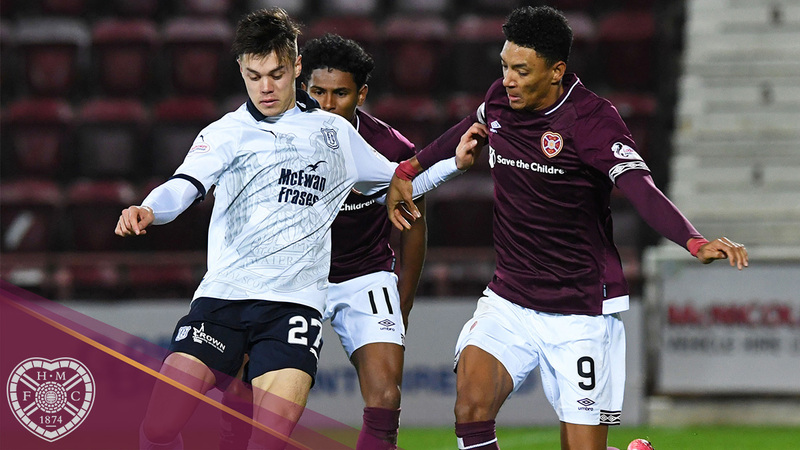 Hearts continued to bombard the Dundee goal but to no avail, and suffered their first defeat in four matches. Hearts: Doyle, Smith, Shaughnessy, Berra, Lee, Clare, Djoum, Mitchell (Mulraney, 72'), Vanecek (MacLean, 33'), Keena, Morrison (Souttar, 56'). Subs: Zlamal, Bozanic, Cochrane, Godinho. Dundee: DIeng, Kerr, Ralph, Woods, Kusunga, Inniss, Dales (Miller, 79'), McGowan, Nelson (Moore, 62'), C. Curran (Kallman, 84'), J. Curran. Subs: Parish, Deacon, Jefferies, Lambert.